Tea in inage en has carefully selected from tea leaves in several kinds of producing areas such as Shizuoka's Motoyama, Kakegawa, Haibara, Fujieda and Uji in Kyoto, that grew up with excellent soil in those areas. The richness of Kakegawa, Kikukawa, Ogasa and Hamaoka tee leaves and the beautiful color of Kawane and Kanaya products and the refreshing sweetness of tea, as well as the powerfulness of Haibara tea, The fragrance of the tea, the beauty of the tea produced by Motoyama, Shimizu and Amahara are beautifully mixed up, and it has become a gem that gathered up in a superb finish. It is a tea that gives moisture to the heart every day but little by little, I always want to hospit customers with the same taste. As the taste of tea is biased towards human's tongue, that is not constant, and thae fact that taste of tea changes depending on the season's temperature and humidity, such trivial things have great attention. And the strong relationship with the tea farmers built by visiting them with our own for over60years, finally this exquisite blend has become a tea in inage en. Place 2 to 3 g of tea leaves per tea in a teapot, and pour hot water. 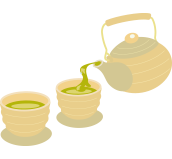 70 ° C for high-ranked sencha and 80 - 90 ° C for middle-ranked ones. Then wait 30 seconds from 2 minutes, and pour into the bowl little by little in order. 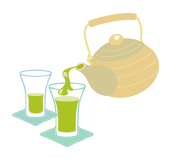 When making watering green tea (cold tea), put some tea leaves in the teapot, pour cold water and wait for about 5 minutes. 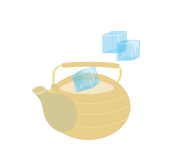 There is also a method of using a special tea bag, pouring it with hot water and pouring it on ice. ４.４.pour the tea into the cup little by little in order. Finish the pot not to miss the good part. shaded Gyokuro Gyokuro refers to the tea made from tea leaves made by tea leaves without grinding tea leaves which were shielded from sunlight and cultivated. The color of tea leaves is deeper than that of Sencha, and sweet taste and rich flavor are characterized. 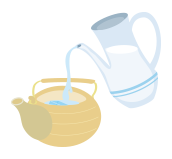 It is recommended that you warm lukewarm water, or water and ice. 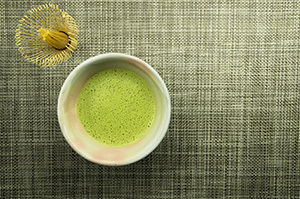 Matcha Matcha refers to a product obtained by melting powders ground with stone mills with hot water or water, as well as gyokuro, "Tencha" which was cultivated by blocking sunlight. It is characterized by thick sweetness and a deep shade. nonshaded Sencha Sencha refers to decocted tea leaves which start harvesting from middle of April. It also refers to tea using common tea leaves in a broad meaning to "tea". Depending on the harvest time, it is called the most tea (new tea), second tea, ,,,. Among them, the new tea, which is said to harvest at its peak in the eighteenth and eighth counting from the beginning of spring, is prized as a special tea leaf with a particularly good aroma and taste. 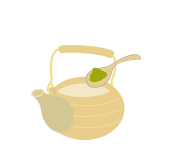 Bancha Bancha(dinner tea), also written as "evening tea" and generally refers to the third tea or fourth tea with the late harvesting time. 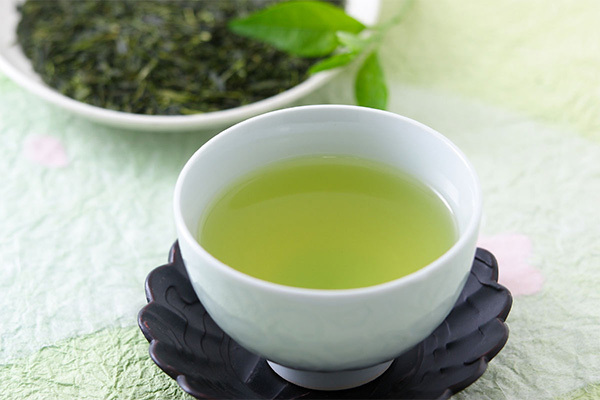 Because they are brought up in the strong sunlight of the summer, Bancha is sometimes expressed as "fragrant scent" while Sencha that is expressed as "scent of fresh green" . Hojicha Hojicha refers to the tea that was brewed with decocted stem tea. It is common and is characterized by a bitter taste, brown color, and fragrant aroma because it is roasted. 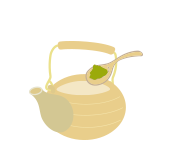 Genmaicha Brown rice tea is the tea which added steamed roasted brown rice to coffee, which is also expressed as "Japanese flavor tea". It features a crisp taste and a fragrant scent. 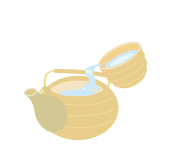 It is recommended to brew in hot water in a short time. It is said that it is effective for diet. Oolong tea Oolong tea refers to Chinese tea that is classified as semi-fermented tea, stopping fermentation by heating during fermentation of tea leaves. It is distinctive aroma and flavor of semi-fermented tea leaves. 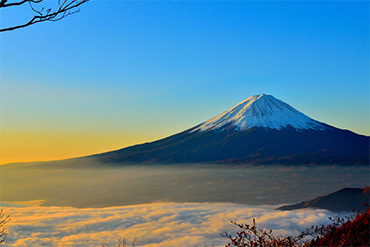 It is recommended to brew with hot water of 80 degrees or more. Black tea Black tea refers to tea that is classified as fermented tea, which is made by completely oxidizing and fermenting the picked tea leaves. It is characterized by rich fragrance and taste of rich tea leaves issued. 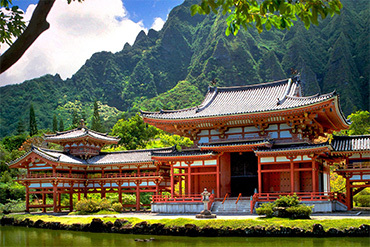 There are many production areas around the world, it is the most popular tea in the world. It is recommended to make it with hot water. Tea is made by heat treating the tea leaves picked up from tea tree. 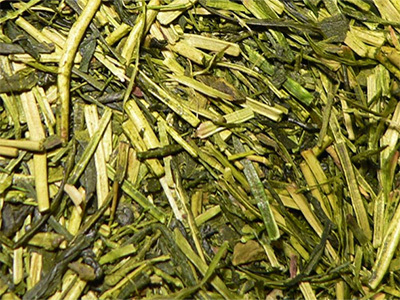 In the process of producing Sencha from coarse tea tea called bargain such as sprout tea, stem tea, powdered tea is made. 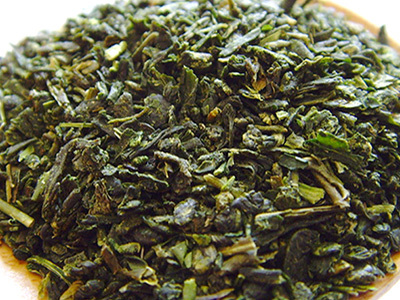 Bud tea is a tea that gathered buds and the tip of leaves that came out when making Sencha or Gyokuro. Since the quality of tea leaves themselves is different only from parts, the taste is not inferior to that of first-grade tea, as there is no change from Sencha or Gyokuro. 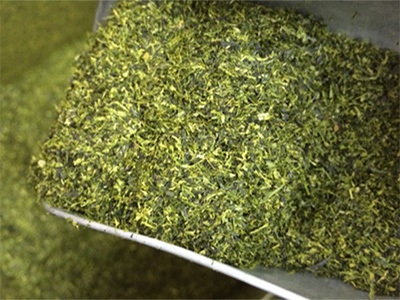 Because the tea extract is condensed, the flavor is strong and rich in flavor, characterized by astringency, bitterness and umami, it is dark green. 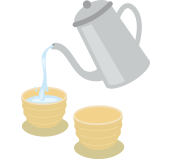 Since tea leaves are rounded, you can enjoy tea any number of times until the tea leaves are opened. It will be delicious if you make it with lukewarm water so that the tea does not get dark. Stem tea is also called stick tea and is made by mixing young branches of tea, handle of tea leaves, sprouts of sprouts. The sweetness, umami, scent component is rich in stems rather than leaves, contains many amino acids, it is characterized by strong umami and less spicy taste. When comparing leaves and stems, theanine which is a component of umami and sweetness is about twice, the pyrazines which are fragrance scent components are about 1.5 times, the geraniol ? linalool which is a floral scent (sweet scent) ingredient is about It is included 4 times. The color is thin, there are refreshing taste and fragrance Stem tea is also a lot of enthusiasts. Powdered tea is a collection of powdered pieces that have come out in the manufacturing process that makes infusa from rough tea. Since the quality of tea leaves itself is not inferior to Sencha, it is characterized by many good taste in terms of price. Because it is powdery, the ingredients of the tea leaves are easy to dissolve, and it is possible to brew dark tea with vivid colors. It can be quickly brewed with hot water in a short extraction time and has a strong taste so it is a staple of tea served as a sushi shop agar for the purpose of refreshing the mouth and erasing the aftertaste of sushi.